It is a natural instinct of a cat to hide its waist so for this reason it should be quit straight forward to train a kitten to use a litter tray. Make it easy for small kittens by using a tray with low sides for it to climb in and out. Placing your kitten directly in the tray straight after meals will help him get used to it. Scratch the tray with your finger to give him the idea. Keep returning the kitten to the tray if they start to go on the floor until they understand. Kittens also know instinctively not to go near their feeding area so keep the tray well away from where they feed and most importantly keep the tray clean. Avoid using clumping clay litter for kittens that are very young as they may eat it and suffer serious or even fatal digestive problems. The first thing you need to rule out if your Ragdoll cat develops litter box problems is a possible medical condition. A visit to your local veterinarian should establish this. Once you have the all clear you can start to consider a behavioural problem. This is a simple thing but is often overlooked. A Ragdoll cat will not use a dirty litter tray so cleaning the tray more often could cure the problem. Kittens have very acute sense of smell and heavily perfumed litter can overwhelm your Ragdoll kitten, if you think this is a possibility consider changing to a different brand of litter. If your kitten uses the same spot regularly try and remove the smell of urine from that area, the scent of urine can be a trigger to a kitten to go in that spot. A proprietary pet urine cleaner should help remove it and if possible block access to that area completely until the problem is resolved. Territory disputes with other pets in the house are a common problem. If the problem cat is lower in the hierarchy the top cat may be preventing it from accessing the tray in its territory. To remedy this introduce more than one litter tray in different areas of the house. 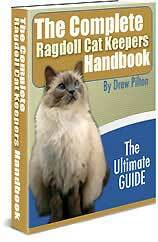 You may not realise this but in your busy lifestyle you could be neglecting your Ragdoll cat. Cats need interaction and could be using your floor as a toilet as a cry for attention. Try to have a regular playtime with your Ragdoll each day and you might cure the problem.